Publicity for Chiquet and more cake! This whole internet thing is pretty amazing. 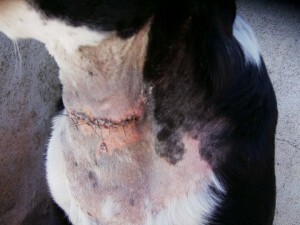 Last week I shared an article about prong collars from a site called shake paws (http://shakepaws.com/). I received an email from them, thanking me for the link (they too feel very strongly about prong collars), and asking if we would like them to feature one of our dogs on their page as Rescue Dog of the Week. 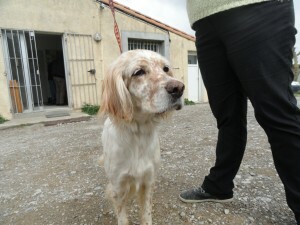 After a bit of discussion, we decided to send them information about Chiquet, as he is a breed not often seen in the UK. And look at our boy, proudly on the front page! Who knows what this will bring! It certainly can’t do any harm! 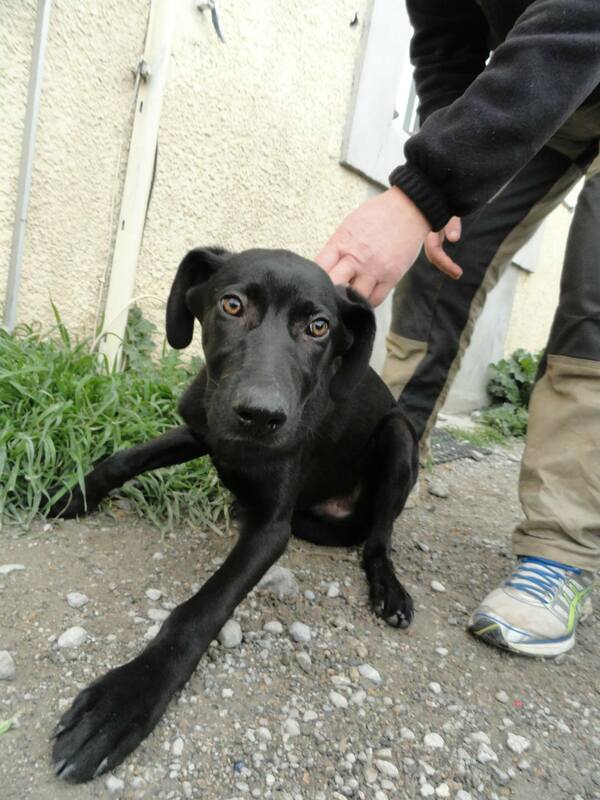 At this rate, with four dogs already scheduled to leave for the UK, we may well be looking for bulk transport! I must add that we are always happy for our dogs to find homes, be it in France, UK or Belgium, but when it is via an association, we make sure that our dogs are not at any risk should things not work out with their adopters. We carry out careful checks to make sure that the associations with whom we cooperate follow the same principles and us, and that our dogs will always have a fall back home. On the subject or responsible homing; the Facebook page received a message this morning from someone who is about to buy a malinois pup for 50 euros, not identified, not vaccinated. Moreover she lives in an apartment and this is her first dog. There is so much wrong here that it is hard to know where to begin. Perhaps the legalities of homing a non-identified animal is a good place to start. Then we have the characteristics of this highly active breed and its suitability for an apartment. I could go on. But I won’t. At the refuge one dog found his owner and there were no arrivals. 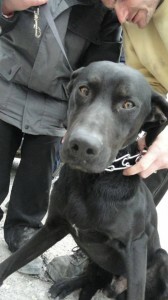 I had not posted photos of the dog, Trust, as he was identified and we were pretty sure that he would be reclaimed. I didn’t want all the pinscher lovers getting excited! Finally can I say a big thank you to Anna who has made this beautiful cake for the fundraising event at Puivert on Saturday. It is for a “guess the weight” competition. Doesn’t it look fabulous! Thanks so much Anna! Don’t forget, Salle de la Mairie at Puivert Saturday 12th April 10am to 4pm. 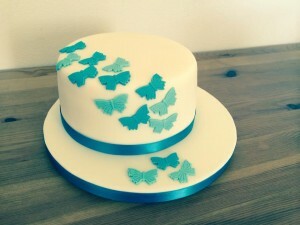 Anna’s cake! Or maybe it could be yours! 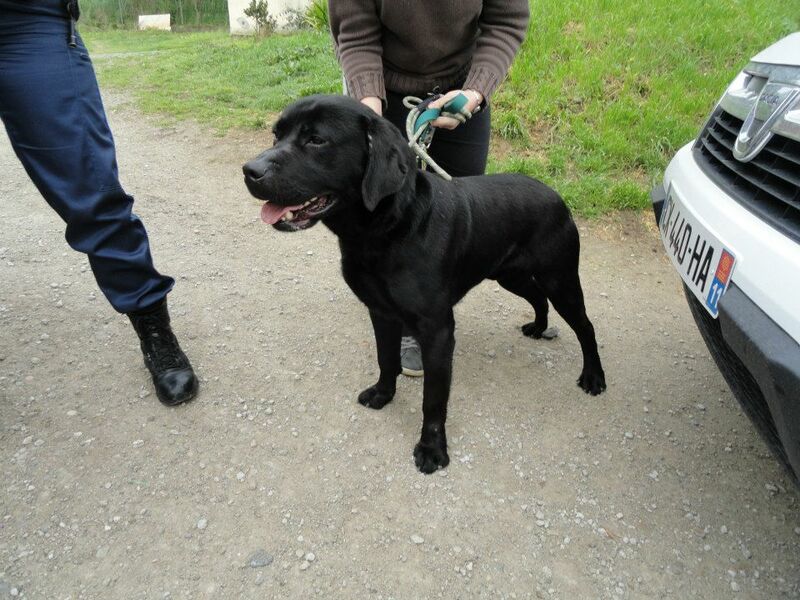 Most of my (and not just my) morning was spent answering messages and phone queries about the dog, now (re)named Phoenix who had been rescued from his violent owner in the centre of Carcassonne on Sunday. The same was true at the SPA this afternoon. It is wonderful that there is so much interest in him. Numerous people have come forward to offer him a home, so inevitably there will be disappointment for all but one of them. For the moment can I just make it clear that no decision will be taken as to Phoenix’s future until he has made a full recovery and been properly assessed. Phoenix may have been psychologically scarred by his mistreatment, and it would be irresponsible for us to decide on his future before we know more about him. I would also like to point out that we have several other dogs at the SPA who have been just as badly mistreated. We have dogs who will limp for the rest of their lives and others who have other “handicaps”. They did not have the “good fortune” to have made the news, so they are not as interesting. Braquou has been with us for over two years, for instance. So maybe one good thing to emerge from this whole sad story will be to attract people to the refuge; people willing to adopt dogs who have been hurt by their previous owners. Plus we have over 100 fully fit dogs looking for homes! Or maybe the effect will be a rise in donations! Today was no fun at all; we had four new arrivals, three of whom were brought in from my favourite place (NOT) Limoux, and the fourth is a bizarre story that I won’t go into in too much detail, but the dog (as yet nameless) is castrated, so must have had an owner. 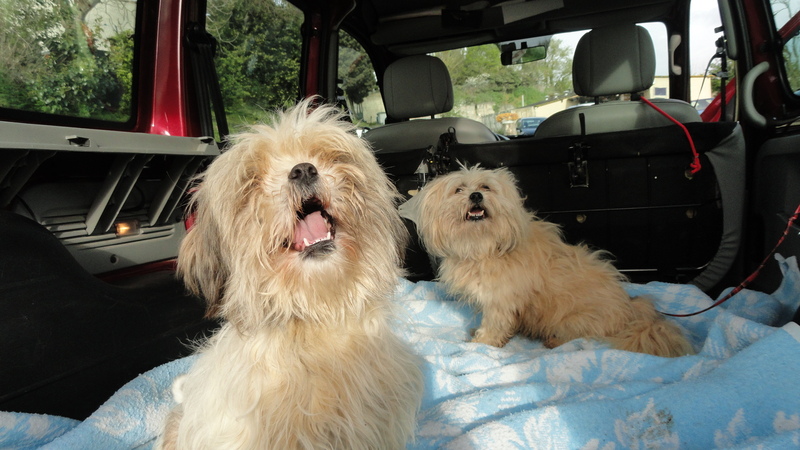 If you recognise any of these dogs, please tell their owners that they are at the SPA. Perhaps they are just lost…..We can but hope. 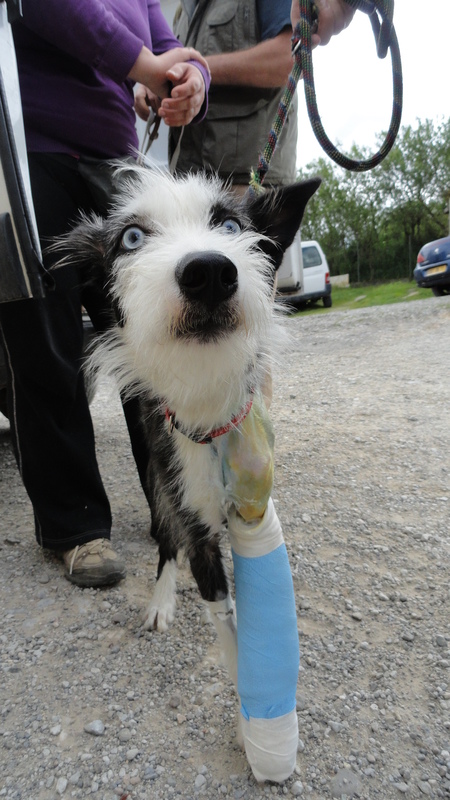 The only good news of the day is that we have a UK rescue association that wants to take Woody; so that is four dogs needing lifts now! Today was much sadder than yesterday. At the beginning of February the Police Municipale brought us a dog who had been found straying. He was chipped so we knew his name was Rantanplan, and we even had the name of the owner. Except it was the same old story, phone number not working, and no one of that name at the address on the central database (because as ever we sent a letter). However we have ways and means (thanks Veronique) and a volunteer was dispatched to the owner’s new address to see what her excuse was. In this case it was not so much an excuse as a lie; she had given the dog away but she could not remember to whom. The neighbours were of a different opinion and said that yes, Rantanplan did live next door. Hmmm. What is the point of doing this, you may ask. Well, it shows that we do not give up easily and that despite people’s attempts to shirk their responsibilities, we can track them down (with a little help from our friends!). 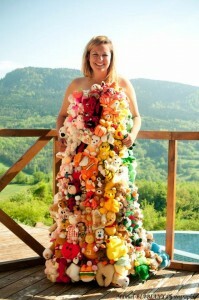 Who knows, perhaps people like this woman will reconsider before doing the same thing again. The question remains, did she know how ill Rantanplan was, and is this why she threw him out? We will never know. 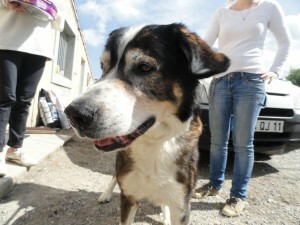 When he arrived he was suffering from severe arthritis and was immediately put on pain killers. However this lovely-natured dog soon started showing signs of aggression, firstly towards other dogs (so we put him in a kennel alone to give him some peace), then gradually towards humans too. Something was clearly wrong. You could see from his gentle, puzzled eyes that this was not normal for him. 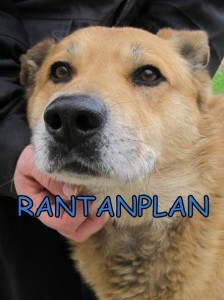 Thorough analysis showed that as well as arthritis, Rantanplan was suffering from an advanced tumour of the ligaments. Any treatment would be purely palliative and this dog would never be pain free. So with much sadness we said goodbye to Rantanplan this afternoon, and he is now running free over Rainbow Bridge. I know his former owner will not be reading this, as it is generally only dog lovers who follow this blog and the SPA Facebook page. She is clearly not one. But I hope justice is meted out in this life or the next. On the subject of dog lovers or not, for those of you who read the news article about the dog who was seen being beaten half to death by his drunken owner in the centre of Carcassonne yesterday, yes the dog is safely in our care. 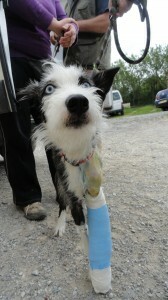 Or rather at the moment he is at the vets awaiting an operation. After this it is hoped that he will go into foster with one of our employees for some TLC. A you can imagine, the damage is as much psychological as physical, but he is in excellent hands. And yes, we are prosecuting the owner for cruelty. When will this ever end? And if you are wondering why we do all the fundraising, here is your answer. I won’t tell you how much this operation will cost, and needless to say it will be us that foots the bill, as the owner has no money. If you would like to donate, or have done so in the past, you know your money will be well spent. No blog is complete without some good news, so here it is. 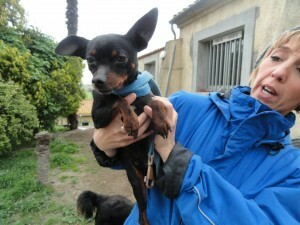 Gulli, the pinscher found his owner! Not only that, though, we have homes for three of our dogs in the UK, and are looking for people to drive them over. The two border collies, Ako and Heart will be going to Wiccaweys, who homed lovely Harlequin for us over a year ago, and Babette will be going to a new association whom Moira will be visiting ( and telling you all about) soon. If anyone is travelling back in May and doesn’t mind taking a canine or two, please get in touch! Open Day means freedom for Bart. 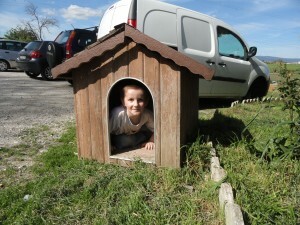 Today was open day at the refuge and the sun was shining brightly. That was not the only bright spot; there was also cake! Thanks to Karen for (wo)manning the stand and to everyone who sent cakes and helped raise a little bit of extra cash for the refuge. 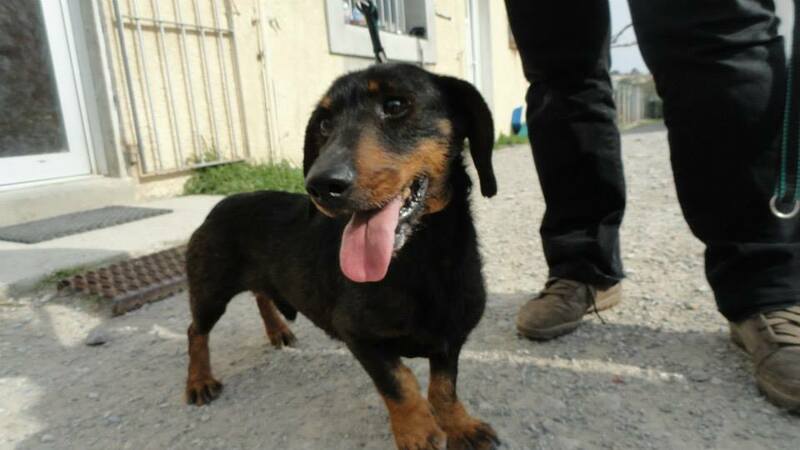 Even the 25 or so euros that we gained in this way helps, it can buy a couple of Scalibor collars, for example, or go towards buying special food for the dogs who need it; we have dogs with obesity problems (Shadow); with diabetes (Scotch) and with highly sensitive stomachs (Beyrouth, the Rottweiler). Today’s lucky boy was Bart. This smallish dog has HATED being at the SPA. 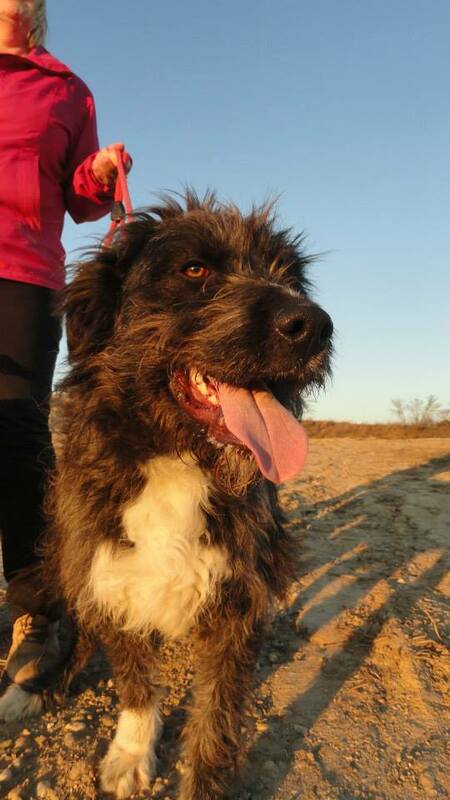 Some dogs cope better with refuge life than others, and Bart definitely fell into the category of “others”. He arrived having been found, unidentified, in mid January. As soon as he had his two vaccinations Moira and I took him for a long walk with his kennel mate, and we were amazed that he knew and obeyed several commands. Sit, stay, lie; all of these came automatically once Bart’s initial excitement at being out of his box had worn off. Someone had clearly put some work into training him, and I just cannot understand why they would have not come to collect him. Surely you don’t put in this much effort and then balk at paying to have your dog micro chipped? 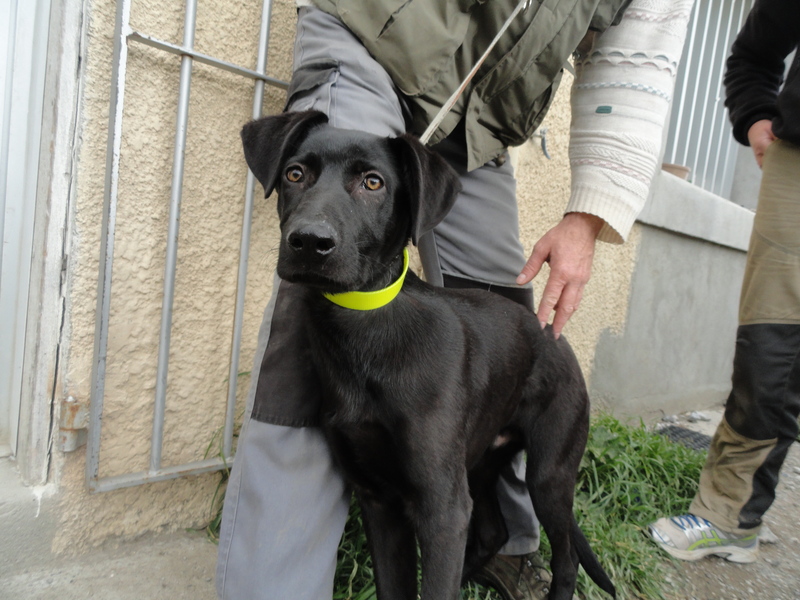 In any case, a couple who live in Dept 84 (some 3 hours away) saw our website and after a few email exchanges, today they came to collect lucky Bart. And he really is going to be lucky! Not only will he be out of the refuge, but he will also have five hectares of land to share with his new friend, a four year old griffon khortal. A perfect recipe for happiness! 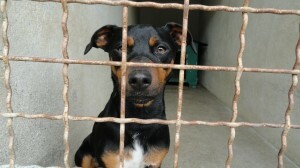 We had one new arrival of the non-dog variety, who quickly made himself at home in a kennel. 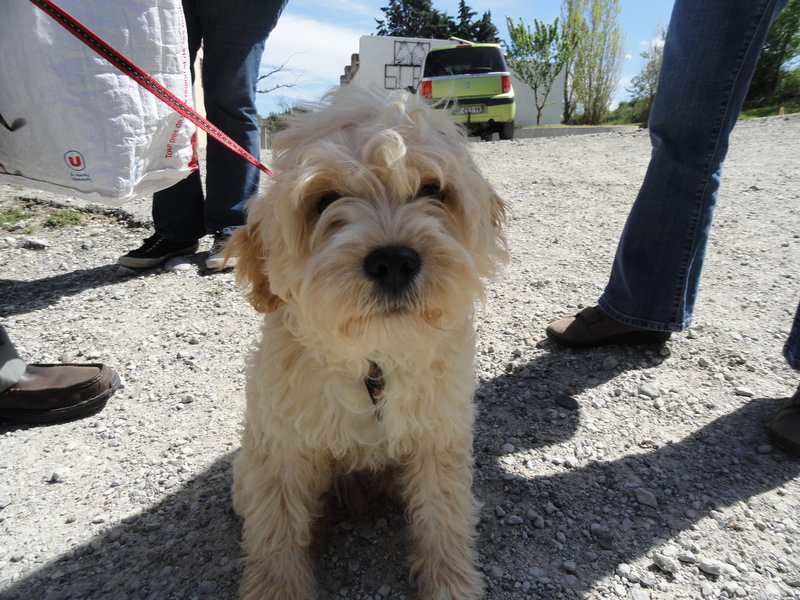 But his dad, owner of Patrouille, took him home once everyone had given the dog a cuddle. A couple of other dogs came to say hello, too; look at how lovely Alpha has grown! There was also a reservation, but as ever I won’t spill the beans till the glorious day of departure. And a strange new human arrival made himself at home! Not the best day in terms of adoptions, but certainly one of the best we have had in a long time in terms of sunshine and general ambience. Our two English language –learning work experience folk, Eric and Adraiana, together with new volunteer Fabrice, have been doing some grounds maintenance. As well as cutting the grass along the edge of the car park and up the banks, they have been doing loads of weeding. I know this may sound unimportant, but on the contrary, it “beautifies” the refuge for visitors. And more importantly, the cake table, which will be in situ at tomorrow’s open day, will be able to stand on solid ground, rather than a mixture of weeds and rubble. We didn’t have any adoptions, but two dogs left the refuge nonetheless. First was Boulba. Task number one when I arrived this afternoon was to take photos of this big, old dog, who had been found yesterday with a tattoo, but with the associated telephone number no longer in service. We knew his age to be 14, so we were quite concerned about him. However this was no abandoned dog, and I was much happier to take the photos of this lovely old man out of his box, when his devoted owner came to collect him. You would never guess this dog was 14, he is in amazing condition. Second to leave was Wendy. Now, we always say that you should reflect seriously before adopting a dog, so should you reflect seriously before abandoning one. Wendy’s family missed her so much that they have sorted out doggy day care. This way, despite their long working hours, the pup will not be left alone all day. We can all make rash decisions in the heat of the moment, when we are feeling overwhelmed, and so please do not be too critical. 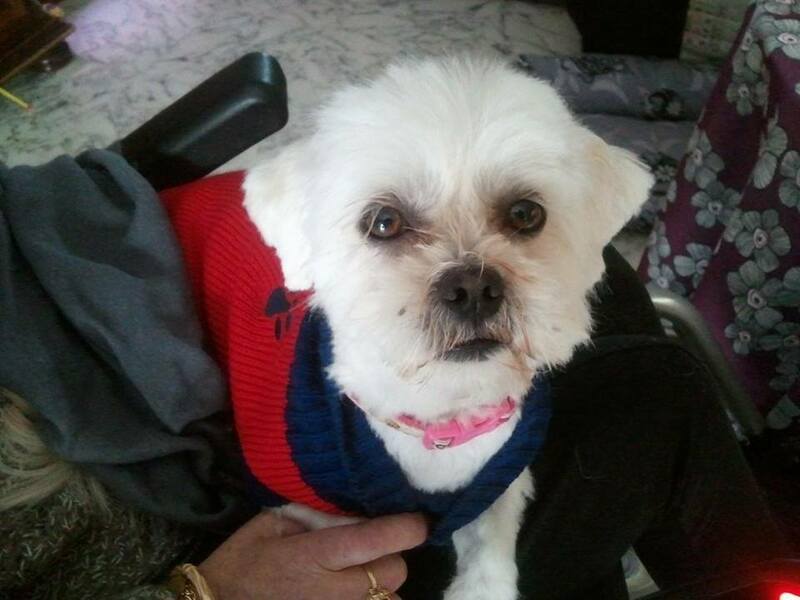 We were contacted the next day by the family to say that they had made a mistake, and once we were sure that Wendy was going to be loved forever, we were happy for her to go back home. She seemed overjoyed, too. So a good day, and hopefully another one to come tomorrow! Open day from 1400-1800! See you there! The refuge was very quiet today, which is not a bad thing, and makes a nice change. That’s not to say that the staff were not rushed off their feet, the phone rings continuously, with people telling us about lost pets, or asking questions regarding our animals. In addition there are always administrative tasks to be done. When a dog is adopted from us, we take care of changing the ownership details on the central database in Paris, and of course this is quite time consuming. And that is just the office. The other employees will have been busy round the refuge, as ever, cleaning out the cages and the cathouse, and giving medications. Plus of course spring has sprung and so the parks are being mown and trees pruned. It may seem like a waste of time, to do gardening type work, but of course we want the SPA to look as nice as possible for our visitors and also there is a practical reason, the longer the grass, the easier it is for ticks to hide! I am sure that many of you will be aware of prong collars; we occasionally have dogs brought to the refuge wearing these and we are all too aware of the injuries that they can cause. Well I am pleased to see that the movement to ban them is gaining support, with both eBay and Amazon refusing to sell what are effectively instruments of torture. Here is an article for the Anglophones explaining a bit more about the collars and why so many people are against them. Who can forget poor Prosper and the state of his neck when he arrived? Not me, for sure. Please boycott any dog training school that tells you to buy such a collar (and yes, this does happen, several people have contacted us to tell us about their experiences). Basically there is always a better way! 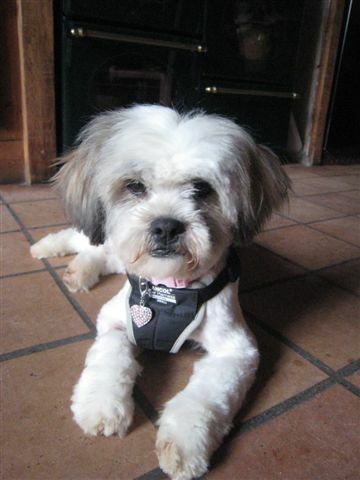 On a lighter note, I thought you might like to see before and after pictures of some recently adopted dogs. Amazing what is under all that fur, sometimes! 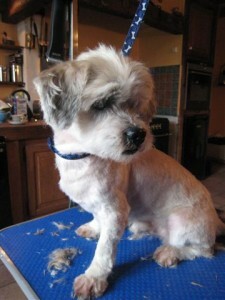 Tim now – his excess fur weighed over half a kilogramme! Rodrigo and Gabriella are reunited. 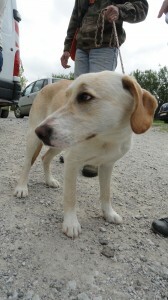 Remember lovely Gabriella who was adopted a week ago today, leaving her kennel mate, Rodrigo behind? 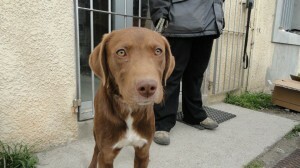 Well today the two were reunited, as Gabriella’s new mum came back as promised, to adopt Rodrigo. I can’t imagine their joy: these two dogs were both left to fend for themselves outside the refuge, as their owners seem to have just dumped them. I had seen Gabriella first, before she teamed up with Rodrigo, after which they were often spotted together. Not everyone wants to (or is able to) take on two dogs, and dogs sharing kennels at the SPA quite often get separated, even after being together for years. So it is especially wonderful when two young dogs get to continue to live together, but instead of having to forage for food in the wild, they will be in a loving family home. 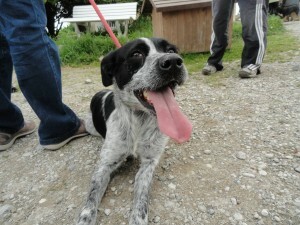 I saw the reunion today, when Gabriella came to the refuge to greet her pal; as their owner said: It is love. Today two dogs arrived, and talk about size difference! The smaller of the two, Gulli, is identified. The big boy, Samson (so we have called him) is not, but apparently they have the same owner. They are sharing a box, as they are clearly great friends. I hasten to add that we don’t usually let dogs of such different sizes share, just in case the bigger one gets peckish! In other news, today we announced an upcoming event that is, shall we say, a bit different. Rosa, one of our volunteers together with her friend Marine, are organising a Flashmob event. For those of you who are not familiar with this concept, it is basically a seemingly unplanned “mobbing” of an event to create a buzz and attract attention to a cause. The Carcassonne Market (place Carnot) will not know what has hit it on Saturday 3rd May. Come along to join in as volunteers perform the SPA version of Pharell Williams’ song “Happy” or just come along to support us. There will be a stand from 10H00 with leaflets and collection boxes, and the following day will be Open Day at the refuge, so who knows what the day will bring! You may even get to see “the dress” being modelled by Rosa below. And Rosa in THE dress. Ready for a Flashmob, everyone? 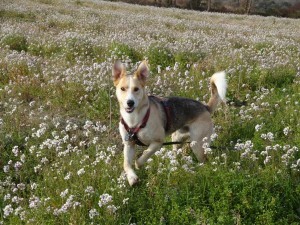 Much better news – Three adoptions! I think the most positive thing I can say about yesterday, is that once people had read the blog and realised how sad I was, several people sent messages of support, urging me and all the other volunteers to keep going and not to give up. You are right, sometimes it is very hard to continue. Unlike the people who abandon their dogs at the drop of a hat, we love dogs (including those that are not ours, but belong to the SPA), but we just have to accept that not everyone is like us. On Facebook and by email people have been telling us about how long it took their rescue dog to settle down, and how rewarding it has been to see him or her through the difficult days. Others have told us that no, their dog (rescue or otherwise) is not perfect, but they love them too much to even think about giving them up. This is very much the situation I am in. One of my four dogs (all rescues) chases anything that moves and no amount or dog school will stop her doing so. I manage the problem. Because I love her. And the other three are not perfect either. I would no more abandon them than I would cut off my arm in shark-infested waters. But many problems CAN be solved by dog school, and advice can also be sought from the SPA itself. If you know that you are not going to have the patience to even try to solve any problems, please do not adopt a dog. Please do not buy a puppy, either, they are not an easy option. A variety of cuddly toys is available at all good toy shops. Now onto SPA news, as I am sure most of you reading this do not need lecturing about how to treat dogs; you are the good guys! After the three abandonments of yesterday, we had three adoptions today. And one of them was one of yesterday’s unfortunates, Palmito. Apparently not everyone is put off by the fact that a puppy is affectionate! The world has not gone totally crazy after all! The second adoption was that of one of my favourites, and a former urgent appeal. Only urgent because I like him so much and wanted him to have a home. 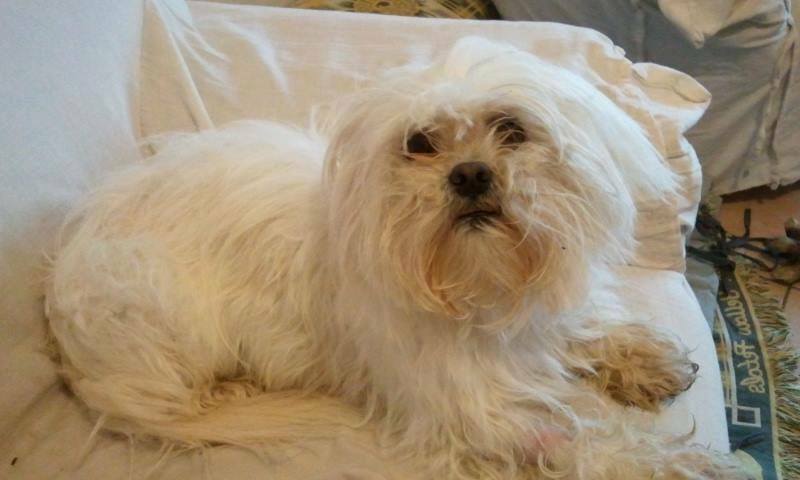 Buffalo, the non-descript but very hairy ball of love was adopted today. And also to my huge joy, Fassbender found a home. 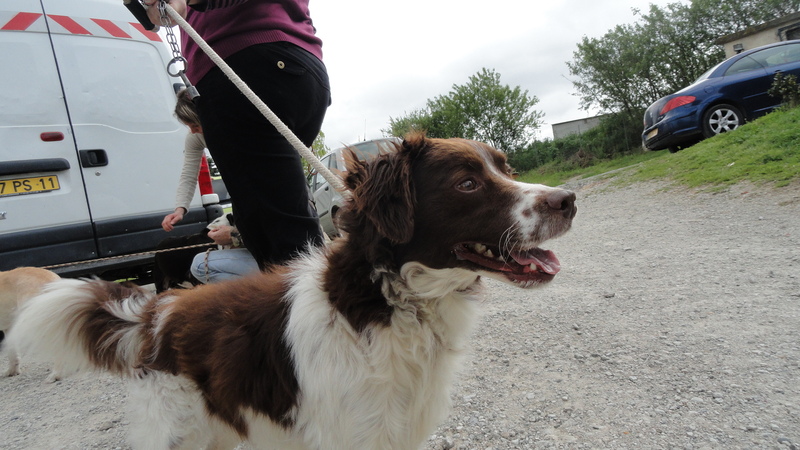 He has just gone on this site as my urgent appeal, again because he was spending far too long at the refuge, not because he was suffering particularly! We wish all three of them long and happy lives and much as we love them, we never want to see any of them again! So much better news today all round! This photo of Lucky (adopted in September) was sent to cheer me up! Thanks Birgit! Reasons to abandon, parts 1 to 3. Please do not look at today’s date and assume that this blog is a joke. Believe it or not 3 recently adopted dogs were abandoned today, all for different but equally ridiculous reasons. I can hardly believe my own words when I write that the first of the day’s rejections was that of Palmito, who was adopted on Saturday. And the reason this puppy was abandoned? “He is too affectionate”. What is that supposed to mean? 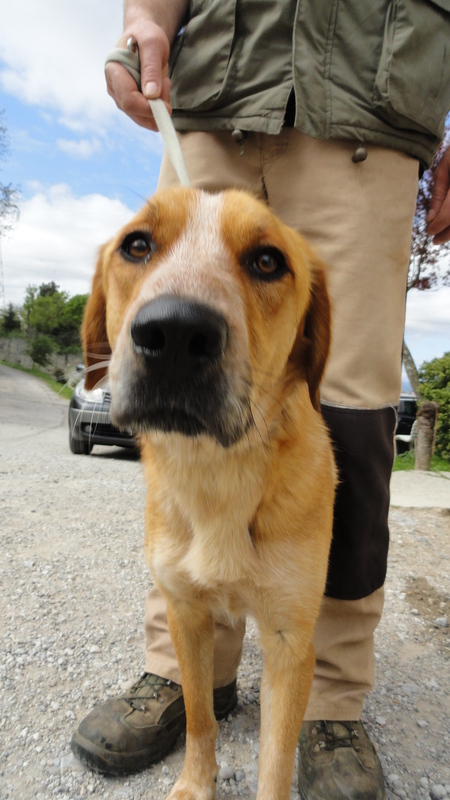 You adopt a dog from a refuge, he is grateful to be saved and doesn’t want to leave your side, and that is sufficient reason to bring him back. And they had the cheek to ask to be refunded the adoption fee. No no and NO! Second to return was Wendy, from the Peter Pan litter. He owner has now got a full time job, and no longer wants a puppy. So two months ago she clearly had no plans to work full time and getting a puppy was perfectly reasonable…. And third and saddest by far was the return of Laika/ Fetide. This is her second failed adoption. Last time it was because she was not good with cats, this time it is because (after 11 days) she is not housetrained. We suggested cage training, but their minds were made up. Of course, this lovely dog may have a urinary tract infection, as it was only “number ones” as we delicately say, but much easier to abandon a dog than visit a vet. In contrast to that misery were all the volunteers walking dogs. About 50 dogs were able to get out today. It strikes me more and more that there are two types of people in this world; those like the SPA volunteers who love dogs and give up all their free time to make the refuge dogs happier, and the other type, who regard dogs as completely expendable and just throw them away for the slightest reason. Tonight I am in the bleakest of moods. 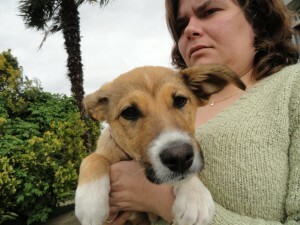 Laika/ Fetide- abandoned after 11 days- not house-trained. Today I spent quite a bit of time writing text for the website. 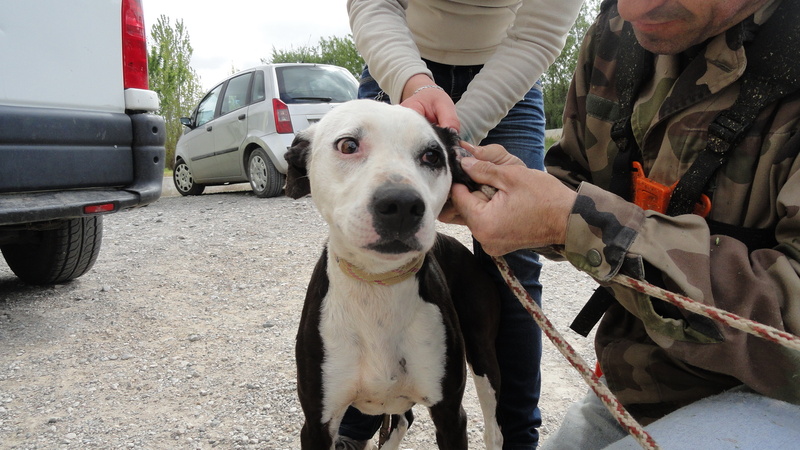 Some of you may have noticed that although the latest news has changed on a daily basis (being as it is this blog), the urgent appeal has changed and adopted dogs been removed, no new dogs have been added for about three weeks. This is because although I write the text about the dogs, the clever bit is done by a couple of web-elves, who have been busy dealing with urgent family matters of late. All is back to normal now, and over the next few days you will see the addition of about 15 newbies. So if you have been waiting for the perfect dog, perhaps he or she will be amongst them. I really believe that there is the right dog for everyone, and like a marriage it is best not to adopt in haste and repent at leisure. Or rather adopt in haste and abandon in haste, which is more common that people actually sticking with it and getting through the difficult bits! As the weather starts to warm up, the volunteers are starting to notice more and more ticks on the dogs when we return from walks, and the employees notice them when the dogs return from the parks. The best tick prevention from a refuge point of view is the Scalibor Collar, as these also prevent sand fly bites, which cause the dreaded leischmania. 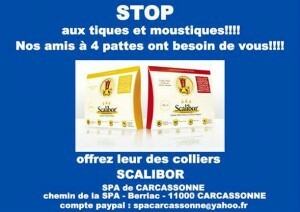 An appeal has gone out on our Facebook page for well-wishers to donate a Scalibor to a dog of their choice. 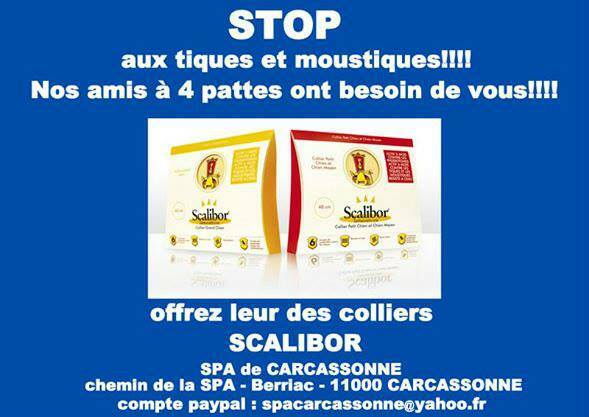 We have about 100 dogs at the SPA, and at about 15 euros each, buying Scalibors is a bit of a luxury for the SPA, but if everyone chips in a bit, we can protect all our dogs! The only news from the SPA today was the re-arrival of the young black labrador, Falco. I think the time may have come to find him a new owner. Very sad. Having a dog takes commitment from the whole family. I am very sorry for him and for his young owner. Sometimes you have to give in and think of the welfare of the dog. Although we have no pictures, we have had news of recently adopted Ycare, who has been renamed Jim (not Moss as per the original plan). He is doing really well and has been busy charming everyone he meets. Can’t wait to see photos, which I will share with you all, of course!